1. Place can of coconut milk in fridge until chilled to set the cream. 2. When ready to use, spoon out the cream from the top leaving the coconut water in the can. Then combine desiccated coconut, golden syrup, coconut cream, and pinch of salt in food processor. 3. Shape into rectangles and place on tray. Freeze for an hour to set. 4. Pour hot water into saucepan and sit heatproof bowl on top making sure the bottom of the bowl doesn’t touch the water. Melt chocolate in bowl, stirring occasionally. 5. Use a fork and a spoon to guide the bars coating them in melted chocolate. Place on rack to solidify. 6. 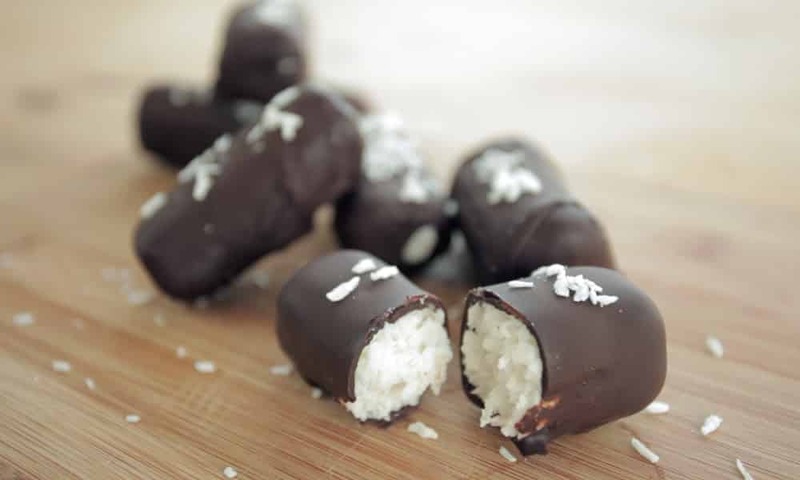 Sprinkle with more desiccated coconut and munch! I’m not sure what “golden syrup” is. Can you explain it a little further? I wish you’d include the nutritional breakdown for your recipes. I can figure it out, but it’d be really handy if you would do it. And does coconut milk come in different sized cans? I have only seen coconut milk in the standard 15-1/2 oz can. Lyles Golden Syrup is easily available online, via Amazon or others. It’s sold in World Market stores, and in many grocery stores as well. It’s an amber colored thick liquid, looking similar to honey or agave but the taste is different. It’s a byproduct from the cane sugar processing. (I think) I’d say find it if you can, anything else will change the taste of such a simple recipe, and this recipe looks delicious! Is the can “Cream of Coconut” that has sugar in it, as an ingredient in pina coladas? Or is it something else? @Curlytop, The can will say “Coconut Milk”. I usually have no trouble finding it in the Thai or Asian section of my grocery store. As you mentioned, the Cream of Coconut has sugar and is not the same. Make sure it’s not “Lite/Light Coconut Milk”. Do NOT shake the can first. After it’s refrigerated you can remove the top of the can, you will see a thick layer of “cream” on the top, which is what you want for your recipe. What do you mean by “cream only”? I know you can get canned coconut milk but creamed? Thanks. @Cheryl, it’s just plain (not lite) coconut milk. After refrigeration the “cream” goes to the top and becomes firm, you can scoop it off the top for use in the recipe. You can add the water that is left in the can to a smoothie, curry, soup or dessert recipe. Could you please include the mL amount of what ‘can of coconut milk’ means for this recipe. Thanks!